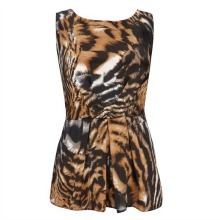 Channel two key trends at once with this gorgeous brown animal print peplum top. This sleeveless top buttons up at the back and is a perfect going out top. Wear this stunning piece with slim leg trousers and court shoes for a fabulous evening outfit. 100% Polyester. Machine washable.